Doug Darden has been gone for nearly twenty years now. Yet the conversations (and the challenges, interrogations, demands) we shared in the fourteen years that I knew him reverberate. The impositions into my complacencies which Doug made on me were spoken and written, but also came to me through his work. Architectural discourse has changed since he left us, and I as I try to understand just how much it has changed I have asked myself time and again, WHAT WOULD DOUG BE DOING NOW? What would be his responses to or even use of the magic wands which architects employ now that they didn’t use – or were barely beginning to discover (and which they are still barely beginning to discover) – in April of 1996? Regarding THE PERFORMATIVE: Tools used to speed and make more efficient the productions of architectural practices would not be a concern for Darden. He would embrace them. Those familiar with Darden’s Discontinuous Genealogies can easily see his categorizing, sorting, and re-forming of purpose and perception finding perhaps greater breadths and depths via methods that build upon what were for Darden a structure for inquiry as simple as iambic pentameter was for Shakespeare’s Sonnets. The poetry lay in the application of the method once it was invented. All of which would leave Darden more time left to draw. It is the question of drawing that would beg us to speculate upon THE CONCEPTUAL and THE PHENOMENOLOGICAL ground for Darden’s post-digital work. Darden would tell us that instead we now must keep our heads. That we must be careful to not let the Rhinos knock them off. Ionesco wrote RHINOCEROS as an anti-Nazi play. Yet it is also and in its essence an attack on all forms of collective hysterias and serious collective diseases passing themselves off as ideologies. “The 1990s (remember that Darden was taken ill at the beginning of that decade and died in its middle) were notably defined by the field of architecture’s near total dismissal of history and theory, which were promptly replaced by technology-driven practices. For Darden, architecture could never touch bottom because it, as indeed all art, MUST be polemical – born from arguments conditioned by DOUBT, by an ontological NOT-KNOWING rather than by the monolithic technological confusion of digital practitioners, which Peter Eisenman has so insightfully if not so eloquently called in one of the conversations surrounding the ARCHAEOLOGY events “making pock-marked skins covering poopoo”. Every technology is used before it is completely understood. There is always a lag between an innovation and the apprehension of its consequences. We are certainly living in such a moment now, and it is often a kind of smug denial of this lack of understanding which keeps the digital practice of architecture from making PHENOMENOLOGICAL as well as CONCEPTUAL advances. Eisenman has more seriously suggested that the digital should be an opportunity for form MAKING, not form FINDING, but that this is not on the current digital agenda. It is unto that breach that I believe our Shakespearean Darden would cast himself today. These excluded contexts were, and would still be, the contexts of Darden. And so, in our changing dialectic, how might Darden’s work be evolving? After our studio with Tigerman, Doug left Harvard for Baltimore, and I transitioned into a studio with Eisenman, a studio which Doug deeply regretted not being able to participate in. If Stanley was for us the herald and the conscience of what might be righteous and just about the cause of architecture, Peter was (in his albeit circumscribed way) our advocate for and exemplar of its practice. Doug and I (well, mostly Doug) was determined that his and my collaboration toward these goals would somehow continue in the Eisenman studio in the spring of 1983. It might also be worth noting that the many-layered histories which influenced my SCHOOL I called ARCHAEOLOGIES, that Doug told me I should more correctly call them GENEALOGIES, then later reclaimed his word and prefaced it with DISCONTINUOUS. I believe that the potentials for naming and the evolving methods to be named which Doug tentatively sought in Tigerman’s Harvard studio, at what was clearly the beginning of his work, and which he continued almost literally until the day he died, would most certainly by operative for him now in the merging CONCEPTUAL AND PHENOMENOLOGICAL metacritical attitudes of his own digital possibilities. And what would his work confront now? What would it look like? In 1988 I bought two copies of this book, one for me, one for Doug. 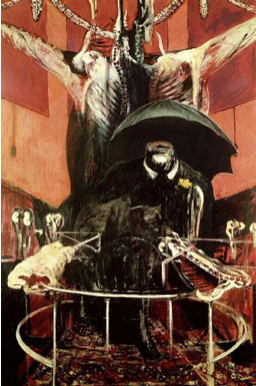 We had talked about Francis Bacon often, but the script for a continued and now guided conversation offered in David Sylvester’s extraordinary interviews with Bacon was irresistible. On the night Doug received his copy he called me from wherever he was then living and with our scripts in hands we read to each other for over an hour. I want to conclude with excerpts from what we might have pondered that night, crossed over with a few images from the works of these two lost friends of the possible, and ask you to look for intimations of what we might have expected from a DIGITAL (or not) DARDEN. into what you see here I believe are a kind of parable of Darden’s method, a suggestion of how Doug’s lateral, all-encompassing interests and influences, as so tenuously outlined in his discontinuous genealogies, increased into the buildings (and buildING) he so lovingly condemned. Bacon called these distortions of the image both a caress and an assault. [Below left Bacon’s center panel of TRIPTYCH 1972; right Darden’s studies for CLINIC FOR SLEEP DISORDERS] The two artists layered allusions into paintings / architecture in their differing attempts to set “traps” to catch “facts” at their most living points. These facts themselves are and remain ambiguous, and as they combine, the ambiguity builds. Their forms work first upon our sensations, then slowly leak back toward the facts – as might be delineated in Darden’s discontinuous genealogies – of their originating forms. When I taught at Tulane University in the mid-eighties I invited Doug down several times to lecture and to review my student work. As I talked with him on the night of one arrival about the program of my studio we would review, which was a slaughterhouse with two sites – one in the city, now outlawed by zoning, and one “legal” site in the swamps outside the city – we sat in my darkened living room listening to Keith Jarrett’s Köln concert. After a long silence Doug observed that Jarrett played like a man in a cage, and that he wanted to know where in New Orleans we could go to feel the cage of the city. The next morning I drove him to the industrial section of the levee, upriver. Not for the industry, I told him, but for the revelation the industries there might suggest of the city’s land-hewed shoving match with the Mississippi River. We had answered Heidegger’s question concerning technology. Doug was in heaven.